You'll be £10.00 closer to your next £10.00 credit when you purchase Group Captain John 'Joe' Collier DSO, DFC and Bar. What's this? John Collier's war began on day one, flying Hampdens in 83 Squadron with his friend Guy Gibson, in a hunt for the battleship Admiral Scheer. By the summer of 1940 he was bombing the Dortmund-Ems Canal at low-level, then Bordeaux and the Scharnhorst at Brest, which led to his DFC and Bar. Given command of 420 (RCAF) Squadron at 25, Collier was hand-picked to direct 97 Squadron, whose Lancasters made a spectacular debut with the 1942 Augsburg Raid. In Gibson's opinion “Joe” Collier's 97 was the best unit in Bomber Command. After 63 missions Collier was awarded the DSO and was selected to join the Directorate of Bomber Operations (B Ops 1) at the heart of the air war: co-ordinating with the USAAF, issuing directives to Bomber Command, and arguing for precision attacks on vital enemy industries and weaponry. In B Ops 1 John Collier was closely involved in planning the Dambuster Raid with Barnes Wallis, drafted the attack on Peenemunde's V-weapons research station, and managed to delay the “buzz-bomb” and rocket assault on London. As target selector for the specialist 617 Squadron, he and Leonard Cheshire VC made imaginative use of Wallis's Tallboy “earthquake bomb”. 617 were also linked to Collier's role with SOE's “Blackmail Committee” that gave French industrialists a stark choice: sabotage your own plant or be bombed flat. By the time he moved to India in 1945 as Deputy Director of Combined Ops, John Collier had been involved in most of the major initiatives of the bomber war. His unpublished memoir of B Ops 1 and his logbooks and letters home give direct authority to this the first biography of this remarkable flyer, one of the most significant young RAF officers of the war. The beauty of this book lies in the fact that it follows the career of an RAF officer whose duties covered the whole gambit of the arena that was World War Two. 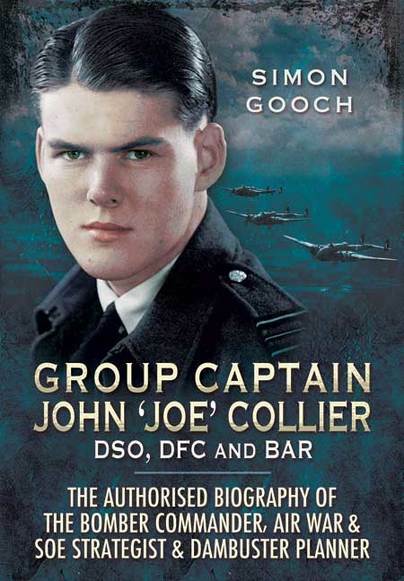 Joe Collier was already a regular at the outbreak of war having joined the RAF on a short service commission in 1936. His early war time experiences took him through the hazardous duties of flying somewhat inadequate bombers in the early years and then on to 97 Squadron via 83, 44, and 420 Squadrons, steadily climbing through the ranks along the way. At 97 he became both squadron and station commander and it was there that his reputation was truly cemented. Having turned an “ordinary” squadron into an elite unit which became one of the very first pathfinder squadrons, Joe was promoted in 1943 to the Directorate of Bomber Operations where his knowledge as a very experienced operational pilot was needed. He served out the war with B Ops undertaking very many duties the pinnacle of which must have been his role in planning the Dambuster raid. At first glance, the second part of Joe’s war duties may appear to have been rather dull. Far from it. Simon Gooch’s narrative makes very interesting reading. This book is well researched and well written. Not once did I lose interest and found myself eager to reach the end of what is an intriguing biography. This isn’t just another war time book. It’s unique in content and well worth seeking out. Tony Walter, 97 Squadron Assoc. The subject of this biography had a very active and interesting war. It is surprising that his story has not been told a long time ago. He was there from the first day of WWII and continued in RAF service through the 1950s, including a tour as Assistant Chief of Staff at NATO in Norway. This account provides an absorbing account of some of the key events in the Bomber Command campaign that did so much to shorten the war, if at heavy cost in aircraft and aircrew. This is a book that every bomber enthusiast will wish to read and re-read. It provides a very useful overview for those developing an interest and provides an enthralling personal story... This is a very interesting person and a very interesting career that provide fresh insights into important aspects of the development of British bombing capabilities. Highly recommended. This is an interesting biography and valuable account of a career that went from Hinds to Canberras, from pilot officer to group captain. The story of a heroic Ringwood pilot and a key figure behind the iconic Dambusters Raid has been brought to light for the first time. As featured on BFBS Forces Radio.